Ask any coffee addict about the importance of the right mug, and he or she will likely agree that it's right up there with the taste of a brew. Whether you prefer a fat, oversized mug for a lazy morning or a small espresso cup to start your day, the perfect container varies from person to person. Like a spouse, once you find the right fit, you need to stop looking. However, unlike a spouse, you should feel free to change its look once you lock it down. Here's how to customize your favorite coffee mug so it's even better than before. If your favorite mug is the perfect fit, but severely lacking in aesthetics, all you need is a permanent marker and access to an oven. Doodle a cool design or draw a detailed portrait of your face - whatever you want to start every morning sipping from. If you're feeling extra creative, branch out from the standard black marker and incorporate colors wherever you see fit. After all, this is your mug, and you're allowed to get as creative as you'd like. Bake it in the oven for 35 minutes at 300 degrees, and let it cool back down to room temperature before removing it. "Those who prefer glitter can easily jazz up their favorite mugs in a few simple steps." Those who prefer glitter can easily jazz up their favorite mugs in a few simple steps. Take a sheet of double-sided tape, cut into your desired shape and stick onto your cup. Choose a shade of glitter - or mix multiple colors if you're feeling artistic - and dust it over the tape. Keep adding glitter until the design clearly shows through, and gently shake away. Keep the glitter intact by brushing on a thin layer of durable gloss finish that will help seal it all in. If you're in need of an inspirational quote to help get you out of bed in the morning, try scribbling it onto your go-to coffee mug. You can even write your name to distinguish between yours and others' in your household, or write sweet nothings to your partner on his or her mug. To do so, simply follow the same process you used for marker art - write your message on a plain mug and bake in the oven for 35 minutes at 300 degrees. Sometimes, you'd rather keep your messages less permanent. Rather than doodle a message you might regret later, simply turn your mug into a chalkboard. All you need is porcelain chalkboard paint - which can be purchased at most arts and crafts stores - and a brush. If you want to get especially creative, tape off a section of the mug that you want to remain intact. It's best to keep the part that touches your lips free of the paint. Try swiping the paint on the bottom half of the mug with a water color brush, and let dry for a full 24 hours. Bake in the oven at 300 degrees for 35 minutes and allow to cool back down on its own. Then, use a piece of chalk to doodle away to your heart's content without the fear of making a mistake. Get kids involved in decorating your mug. Add some more sweet to your coffee with sentimental mug art. 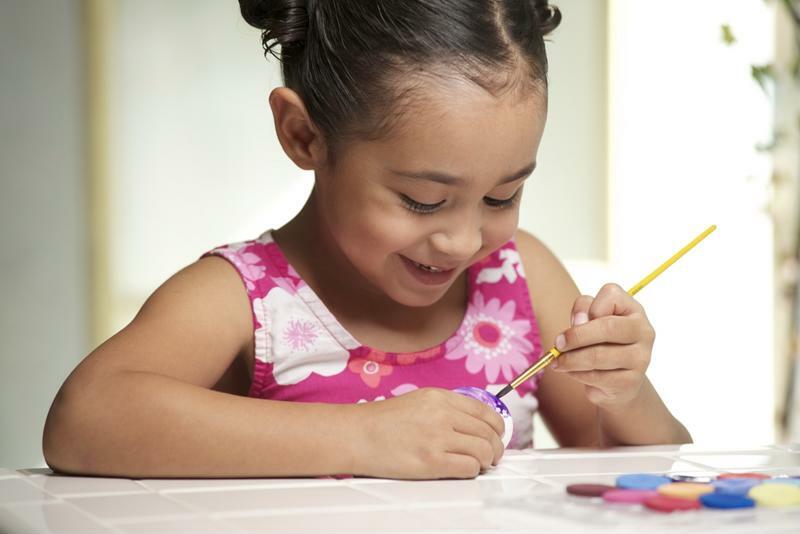 Call on the help of your favorite little ones and cover the entire inside of their hands with paint. Have them press their hand onto a clean, white mug and gently lift straight up. Let it dry completely, and cover with a thin layer of durable gloss finish.